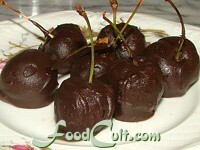 Desserts - Free, Easy Recipes @ FoodCult.com - A Place for Galganov's Recipes and More - Food Matters! What more can be said - an enticement by parents and a treat for children of all ages. My mother, at over 88 years of age, still insists on eating little enough so there remains room for dessert even having dessert first, sometimes, to make sure she doesn't miss out. Dessert can be an amuse bouche (or amuse-gueule) like chocolate covered cherries - used to clean the palate between courses AND as a final dinner closer. Cookies and quick breads/muffins, chocolates, ice cream ... all sorts of things may be enjoyed as dessert. Even crepes can make a delightful desert. We hope you'll enjoy our desserts ... and find those hidden in sections like crepes and cookies!